Valve's portal gun from Portal and the upcoming Portal 2 isn't real, or is it? A Swedish man has created the perfect room accessory for any Portal fan. Using a $15 Kolja mirror from IKEA, he now has a portal on his wall. Gamereactor has the visual tutorial on how to make it, but it's pretty simple. Buy an oval shaped mirror. Paint the edges of it blue. Hang it on the wall. You're done. 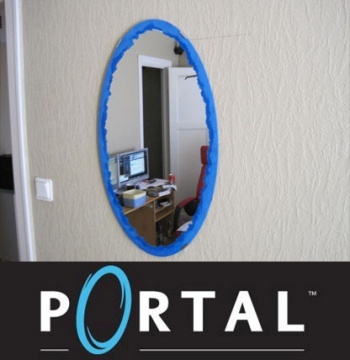 It's so simple it's pedestrian, but you've got to admit the Portal mirror is really cool. The only way to get something more realistic on your wall would be to invent and implement GlaDOS into a secret facility, and that wouldn't be good for anyone. Either that or someone could make two of these out of oval-shaped LCD screens that show a camera feed of what each other are pointed at. That doesn't sound very hard at all. If you make one, don't be silly and break it by trying to jump in. At the best, you'll get shards of mirror in your face. At the worst, you'll end up in a faraway place where an intelligent AI program will be trying to kill you, that you defeat, but then somehow recaptures you for an even harsher sequel.